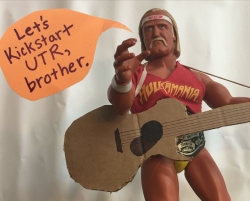 In just a few days (on Oct. 13), UTR will launch our first ever Kickstarter campaign. We have one month to raise 100% of our goal, or we don't get a penny. And these funds are not for our day-to-day operational expenses... these are specifically to back the 2017 creative relaunch of UTR, which includes new website, new branding, increased video production, and more. We are quite familiar with Kickstarter, as we have backed over a dozen projects in the last few years. We love seeing the fun reward tiers... and we are especially excited about ours -- because it's made possible in part because of the generosity of many UTR artists. AND these rewards provide a fantastic "bang for your buck," with what you get in return! So here is your official sneak peak at the upcoming rewards. Be on the lookout for our Kickstarter Campaign.... launching on October 13th!